Apple announced during its quarterly earnings call that Mac OS X 10.7 Lion, its next-generation operating system, will launch on the Mac App Store on Wednesday. The announcement from Apple Chief Operating Officer Peter Oppenheimer confirms an exclusive report from AppleInsider on Monday. Also rumored to launch is a refresh to the thin-and-light MacBook Air notebook, powered by Lion. Update: Accordingly, Apple on Tuesday released Migration Assistant Update, allowing users to prepare their Mac for the update to Lion through the Mac App Store. It is a 312kb download available via Software Update or direct from Apple. 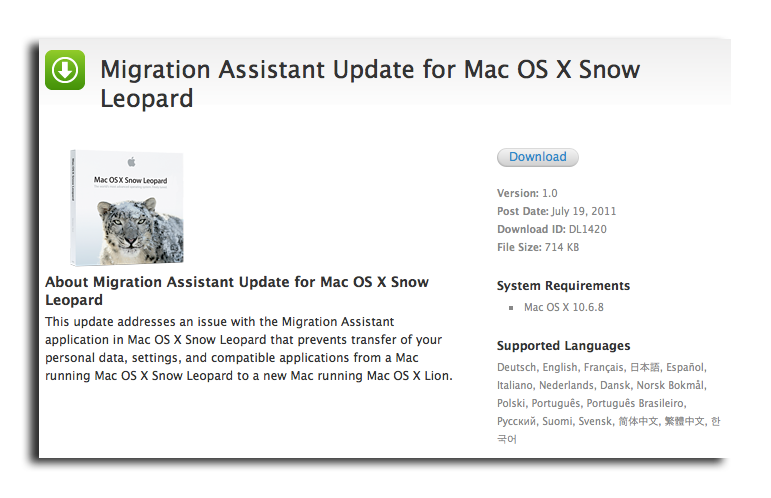 "This update addresses an issue with the Migration Assistant application in Mac OS X Snow Leopard that prevents transfer of your personal data, settings, and compatible applications from a Mac running Mac OS X Snow Leopard to a new Mac running Mac OS X Lion," the official description reads. Apple has been holding off on the introduction of new Mac hardware until it finally releases Lion. Apple had not previously not offered a specific launch date for the operating system, only promising that it will become available on the Mac App Store for $29.99 at some point in July. Signs of an impending launch continued appear as the week went on, with Lion said to have arrived at Apple retail stores on hard disks this week for installation on demo machines, and photos of promotional materials at third-party stores.